TEXAS: Austin On Alert After Fatal Package Bombings - Joe.My.God. Police in Austin say “similarities” between three package explosions in Texas’ capital city this month, two fatal, lead them to believe the incidents are related. 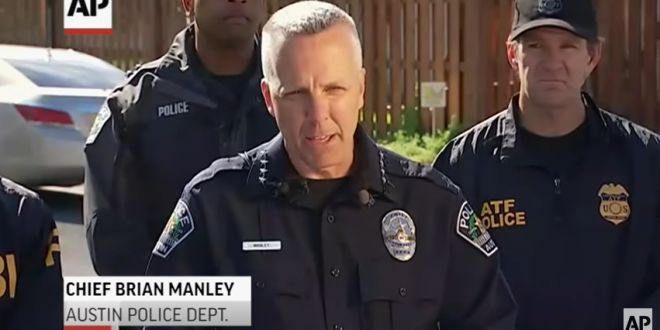 The latest fatal incident, reported Monday morning, killed a 17-year-old boy and wounded a woman, Austin police chief Brian Manley said. The boy died at the scene and the woman in her 40s was taken to the hospital with potentially life threatening injuries after the explosion at the East Austin home before 7 a.m. In an earlier incident March 2, Anthony Stephan House, 39, was killed when a package exploded at his northeast Austin home, CBS affiliate KEYE reports. Police also responded around 11:50 a.m. Monday to the report of an explosion in southeast Austin in which a woman was badly injured. Police received multiple calls about an explosion, Manley said at a press conference Monday afternoon. The victim in the incident came outside of her home to retrieve a package left on her front step, which exploded. Manley — who reportedly was on the scene of Monday’s first explosion when he was called to the second — warned residents to avoid opening unexpected packages. “If you receive a package that you are not expecting or looks suspicious, DO NOT open it, call 911 immediately,” he tweeted. Authorities had said they believe the first two explosions are linked. Both took place in the morning hours, and in both cases, the package was not delivered through the U.S. Postal Service, authorities said. In addition, both of the homes belonged to African Americans, Manley told reporters Monday morning. “So we cannot rule out that hate crime is at the core of this; but we’re not saying that that’s the cause as well,” the police chief said. Nelson Linder, president of the NAACP of Austin, said the person injured in the third explosion was not African-American.